IDEO, The worlds greatest proponent of User Centered Design have released a ‘toolkit’ to promote a human centred approach to social development projects. 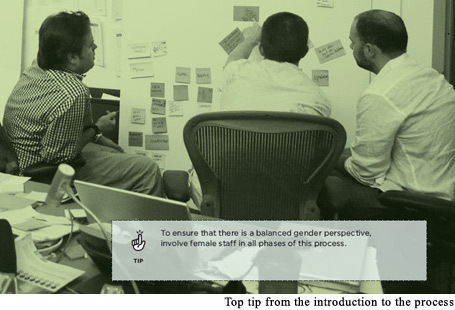 I’m sure IDEO had the best intentions, but with half of the world’s humans being female, do we really need to be told to include women in a Human Centred Design process ? This entry was posted in Empathy, Observations, User Centered Design, UX methods by Nick. But seriously, I think it’s a good to remind people to ensure that woman are represented – especially in studies involving societies where they don’t typically have an equal voice. That’s a good point Mathew, not all of society is as well balanced as we’d hope. Perhaps that was their experience so they felt they needed to add that comment. or … maybe the only photo they had to hand when they went to print was this one with the three blokes in it and they thought it looked a bit one-sided. From the David Brent school of design advice? Hmm.. yes, maybe they simply skipped the first two letters and it’s become ..Man Centred ? Three of the UX companies I have worked for were founded by women… I’m sure they’d be chuffed to be considered worthy of participating in an affinity sort. I think what disturbs me about this the most is that it so clearly implies that it was written for the guys, by the guys. I’d find this depressing, except that it is such a long way from my personal experience of working in this field, thank goodness. Having not had a chance to read this document in full, I wonder whether they had equal concerns about involving other non-white-male perspectives? UX is gender neutral, however other industries, such as railways and to a perhaps finance, are more male dominated. My experience is that clients prefer to work alongside consultants with whom they identify; they feel safer. This includes less challenging aspects, such as matching the size of company to the size of the consultancy (big clients, big consultancies). In turn, then, if our client isn’t practiced at inclusion, I wonder if usability tips the place to encourage change to individual and corporate behaviour? …heaven help them when trying to cater for their future needs. If including women in UX type projects is a first step to their recognizing the value of a balanced team, you might be onto something there Catherine.